In a large skillet, heat 2 Tablespoons of olive oil on medium heat. Add onions and sauté for 1-2 minutes until tender. Add mushrooms and stir. Add tomato paste, salt, black pepper and stir until combined. In a separate bowl, mix broth, soy sauce and tapioca. Add the broth mixture in the bowl to the onion and mushroom mixture in the skillet and stir to combine. Cook and stir until both mixtures are combined and thickened. Transfer this skillet mixture into a slow cooker. Using the same skillet, heat the pan on medium high heat with 1 teaspoon of olive oil. When oil is hot, add beef. Brown beef on all sides. 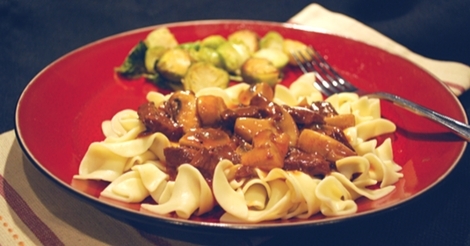 Beef will brown if you let it “stick” a little, rather than constantly stirring. If you double this recipe, it will help to brown only ½ of the meat at a time. 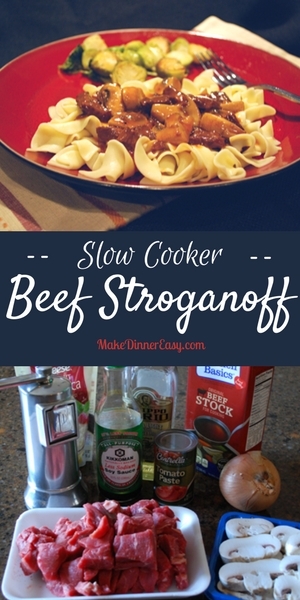 Transfer beef to slow cooker, scraping pan well. Cover and cook on low for 9-11 hours or on high for 5-7 hours. Meat is done when it is fork tender (usually the longer it cooks the better). Use a large spoon and remove any visible fat that is on top (the fat will be a clear color, rather than a beef color).